Why is it such a difficult ride at the moment? Whenever there is a seeming conflict in daily and weekly charts, its going to be a choppy ride as the market decides which one will prevail. Let us take a look at the daily chart and hourly chart of the Nasdaq and QQQ. The daily chart of the Nasdaq futures tells us that it is at a support area. On the other hand it is still in a daily downtrend with no bottoming pattern in sight. With the techs below the 20 MA, 50 MA and 200 MA it is still not a very nice environment to long stocks unless you plan to buy the oversold rebounds. It is not a buy and ride the uptrend higher type of trade. For a convincing bottom, I would like to see the Nasdaq form some kind of bottoming chart pattern like a double bottom, and break back above the downtrend line and break above the daily 20 MA and 50 MA and subsequently have a bullish 20 MA cross 50 MA. The 60 min chart of the Nasdaq futures show many attempts at bottoming but failing. The first and second ascending triangle bottoming was met with failure as it failed to break higher. We can now see another wider ascending triangle breakout trying to happen as the Nasdaq has a bullish cross. 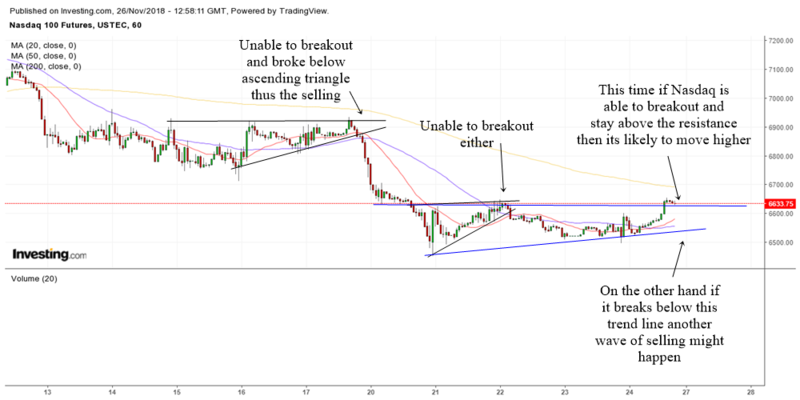 A decisive break above the pattern will likely help send it higher but a break below the uptrend line of the ascending triangle will cause more selling to happen in tech stocks as well as weakness in the broader market. 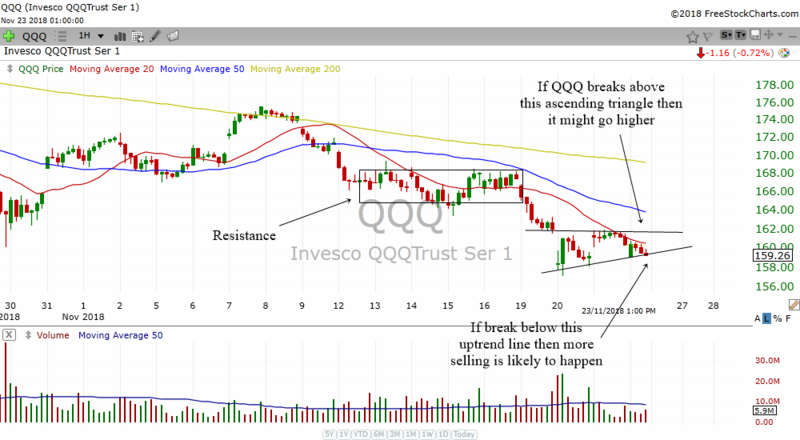 QQQ's 60 min chart above shows how a 60 min ascending triangle setup is happening. A breakout will likely send it higher to the resistance area which I think will take quite a lot of effort to overcome. On the other hand, a failure of the pattern with the QQQ breaking below the uptrend line will likely send the markets lower again. 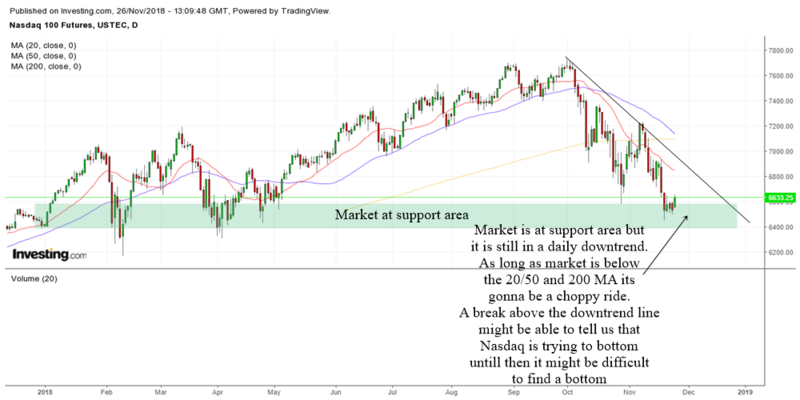 Hope this analysis helps in navigating this difficult and choppy market.